Hawaii Native Status: Introduced. This naturalized ornamental garden plant is probably native to Mexico. Description: The flowers are tubular, pendulous, solitary or clustered, up to 2 1/2 inches (6.4 cm) long, and have an exerted central column tipped with a 10-branched style above multiple anthers. The flowers look very much like drooping, wilted hibiscus flower buds that never open. The leaves are dark green, alternate, almost hairless, edged with scalloped teeth, and lanceolate to ovate in shape with a pointed tip. 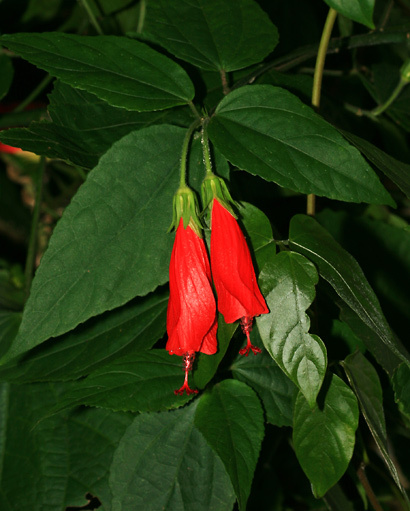 This shrub is commonly cultivated but also grows at the edge of disturbed, low elevation mesic (moderately wet) forests. 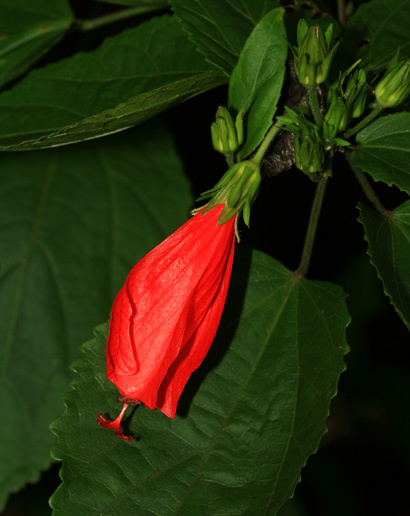 The similar Wax Mallow (Malvaviscus arboreus) has hairy leaves and upright (non-pendulous) flowers.